As I mentioned earlier this week, my best friend Shannon recently had a birthday. We couldn't get together until this past Sunday, however. This weekend I gave her one of my favorite cards I've ever made...which took me about three hours to do. But hey, if you're going to spend three hours making a card, it should be for someone special. Really, the reason it took me that long was that I tried way too many different techniques all on one card, and I was having a few issues with my embossing. 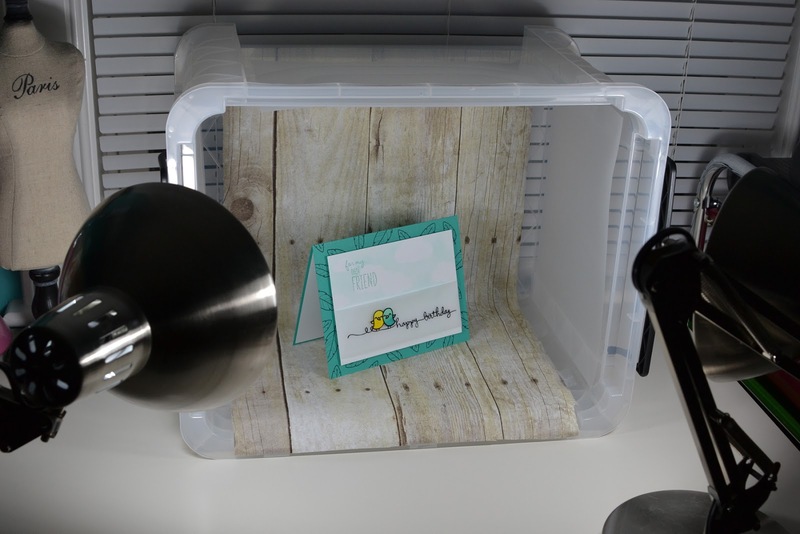 Anyway, before I get into the card, I wanted to quickly show you my new portable DIY card photo studio. I have a light tent, but I find it to be too big to keep open all the time, and bigger than I need for photographing cards. I had the idea to try to make my own out of a cardboard box and vellum. As I was looking around for a box, however, I suddenly thought, why not try a clear box instead of cutting apart a cardboard one. So I found this great file box at Target that sits flat when placed on its side. It was also on sale, a bonus. I added a couple of sheets of vellum, and a small section cut from the photography backdrop I have been using for my headshots. (This is actually a roll of bulletin board paper I found at Michaels. It's very long, so cutting a small section from one end didn't matter). I already had the two desk lamps (previously purchased from Target). I may change the backdrop out occasionally, but I love how convenient the box is. I can just put the lid on top as well to keep the backdrop from getting dusty or damaged. Back to the card. I have a few new stamp sets I wanted to use. One of them was a Simon Says Stamp Lawn Fawn exclusive, called Feathered Friends. 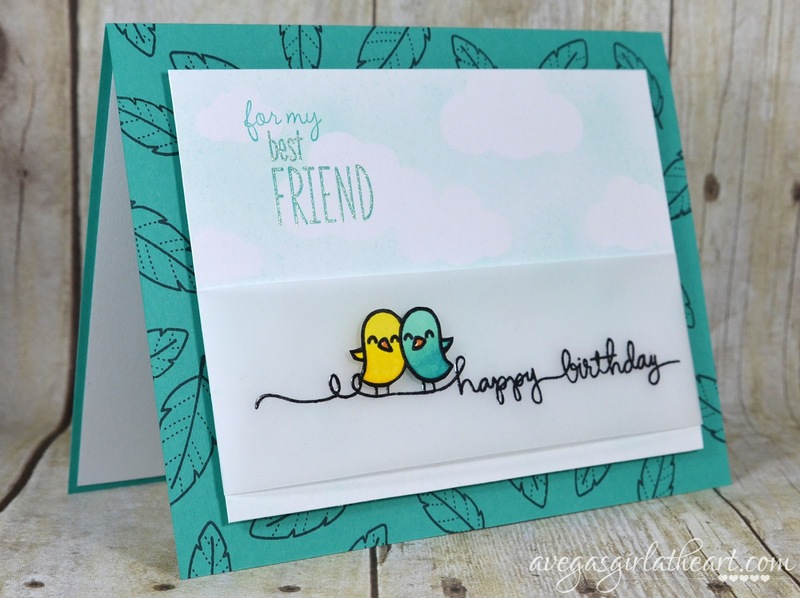 I used the birds, "friend" (I cut apart the "hello friend" stamp) and the feathers. The words "for my" and "best" came from The Stamps of Life tinytitles2stamp set (again, I cut apart a couple of the stamps). If I know I'm not going to sell a stamp set later on down the road, I have no problem cutting or modifying the stamp to fit what I need. Just a tip when thinking about how to stretch your stamps. The "happy birthday" is from the Handwritten Borders stamp set. When I saw this set I knew I had to have it. I love handwritten stamps and fonts so much. 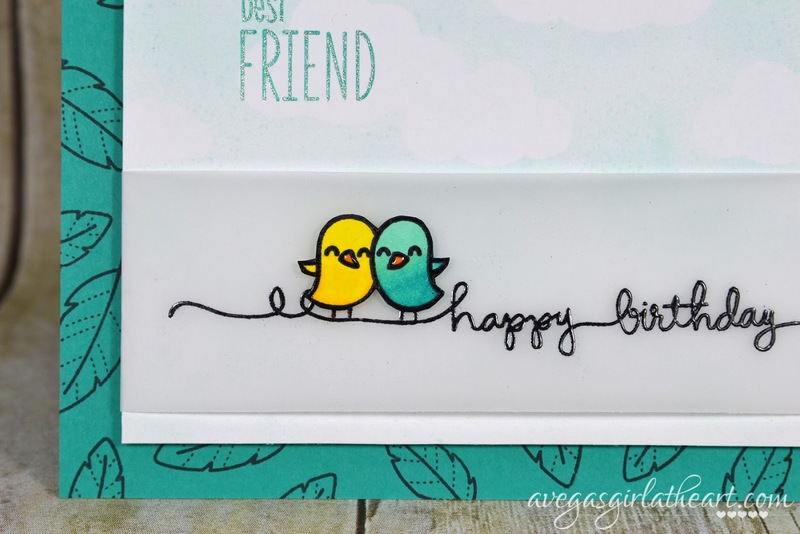 I stamped "happy birthday" in Versamark on a sheet of vellum, and used black embossing powder (Recollections brand) and my Martha Stewart heat gun to emboss. I don't know the reason why, but heat embossing over vellum looks so elegant and smooth. I think I gave a little squeal of delight when I finished heat embossing that. I also heat embossed the bird stamp, but on card stock, and then I colored the birds with my Copics and Spectrum Noir markers. (Copic #s Y02, Y06, and Y08, and Noir #'s OR1, BT4 and BT5). This is the set of Copics I have had since 2011 and I haven't purchased any others. I attached the birds with tiny foam dots. The legs I actually embossed on the vellum, because those would have been impossible to cut by hand. When the card was finished, I added Glossy Accents to the birds' beaks. For the cloud background, I used a sheet of white card stock. I punched out several clouds using Fiskars cloud punches, and then attached them with temporary adhesive. I then used the Stampin' Up! mister tool (this is the same tool with Tim Holtz' branding on it, since SU no longer sells it) and my Copic Ciao markers(BG10) to mist the card stock. Then I just removed the cloud shapes. 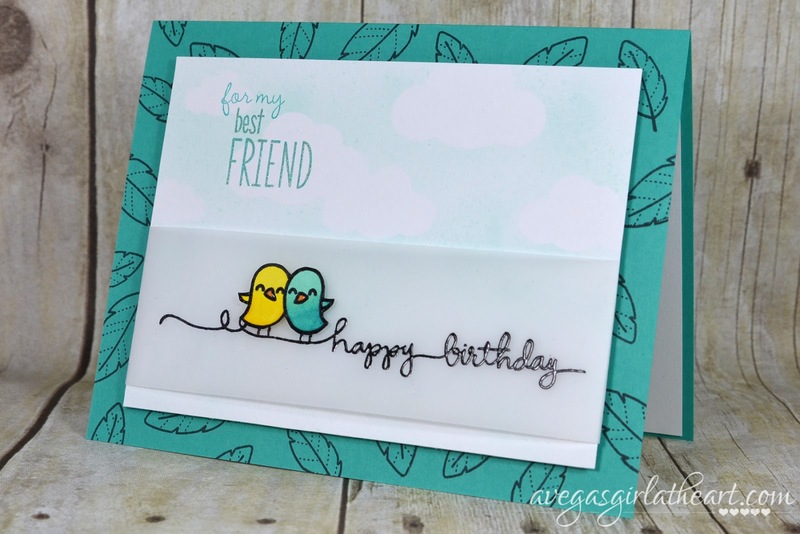 Finally I stamped "for my best friend" using Versamagic Turquoise Gem ink, and added a bit of Gelly Roll Clear Star over the "best friend" part. 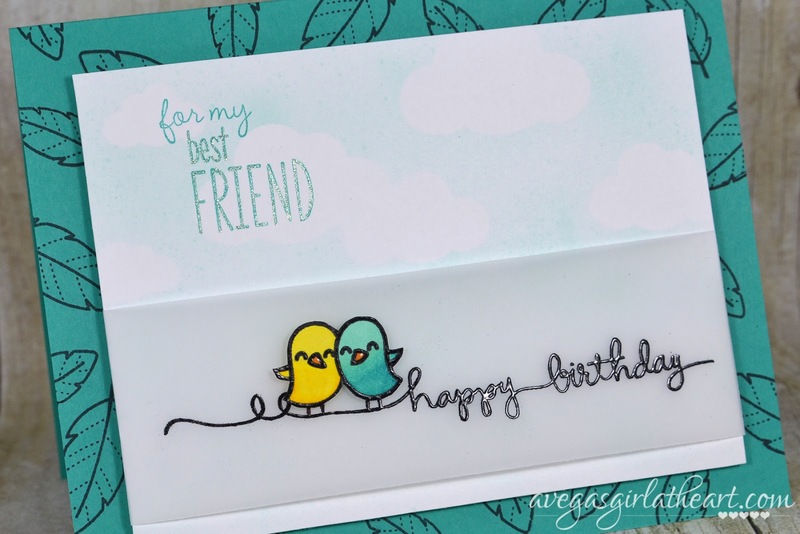 For the card base, I used Stampin' Up! Bermuda Bay card stock (cut so that the card was 5.5"x7") and stamped the feathers all around the edges using Memento Tuxedo Black ink. And of course, Shannon loved it (like she'd tell me if she didn't! ).